Contact dermatitis is an itchy, blistering skin rash typically caused by the direct contact of a substance with the skin. 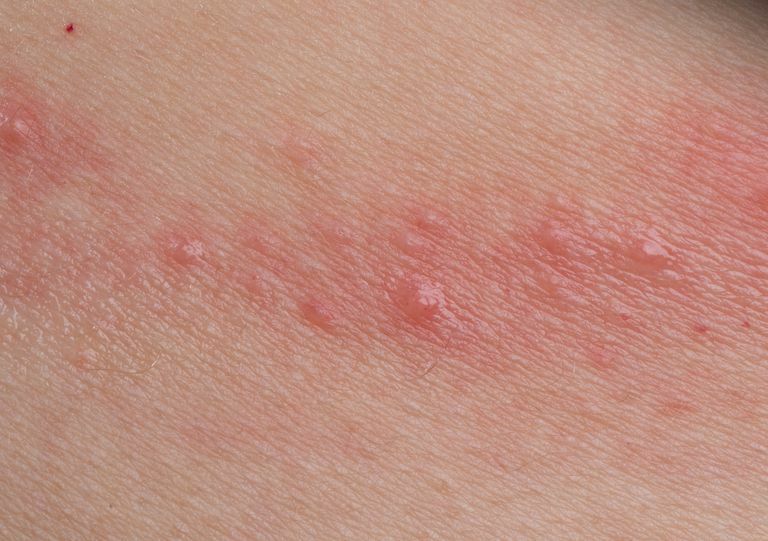 There are two types of contact dermatitis: irritant and allergic. This difference is often difficult to tell apart, but it's not usually an important distinction to make. There are several different causes of contact dermatitis. Along with the evaluation for contact dermatitis, which includes patch testing, a person’s history of exposure to various chemicals can help to determine the cause of the rash. Occupational skin diseases are second only to traumatic injuries as the most common cause of job-related diseases. Approximately 40 percent of worker’s compensation cases involve skin problems, and up to 95 percent of these involve job-induced contact dermatitis. The most common jobs associated with contact dermatitis include healthcare professions (usually due to a latex allergy), food handlers and processors, beauticians and hairdressers, machinists, and construction workers. Plants from the Toxicodendron family, which include poison ivy, poison oak, and poison sumac are the most common cause of allergic contact dermatitis. The rash from these plants results in a linear, or streak-like group of itchy blisters or bumps. The chemicals released from the plants, called urushiols, are what cause dermatitis. Urushiol can be carried on the fur of animals, garden tools, sports equipment, and clothing. The smoke from burning Toxicodendron leaves can also carry urushiol. Other plants related to Toxicodendron may contain urushiol, and cause similar contact dermatitis. These include mango skin, cashew nut oil, and gingko leaves. Patch testing is not necessary for Toxicodendron plants since this is a diagnosis made with a consistent history and physical examination. Most people know when they've come into contact with poison ivy or one of its relatives within a short time after being exposed. Other causes of plant contact dermatitis include contact with the Peruvian lily, a common cause of hand dermatitis in flower workers, as well as seasonal contact dermatitis from exposure to airborne pollens. Patch testing may be performed in dermatitis caused by these plants. Cosmetic-induced contact dermatitis is very common, since people may apply numerous chemicals to their skin, hair, and scalp on a daily basis. Typically, the rash will occur on the skin where the cosmetic was applied, although sometimes the rash will occur on another part of the body (for example, reactions to nail polish may first cause an eyelid rash as a result of touching the eyelid). Fragrances appear to be an important and common cause of contact dermatitis. Rashes can appear on the neck in a pattern consistent with spraying perfume on the area. Patch testing to fragrance mix can help identify the cause and provide important information on avoidance. Avoiding fragrances can be difficult, and use of products labeled “unscented” can be misleading, as a masking fragrance may be added. It is better to use products labeled as “fragrance-free”, which are typically tolerated by people with fragrance-induced contact dermatitis. Hair products are another common cause of contact dermatitis. Common chemicals include phenylenediamine in hair dyes, Cocamidopropyl Betaine in shampoos and bath products, and glyceryl thioglycolate in permanent wave solution. Reactions to acrylic coatings on fingernails are a common cause of contact dermatitis on the fingers, as well as on the face and eyelids. Many people who use cosmetics on their fingernails (artificial nails or coatings on natural nails) may touch their face and eyelids with their nails. Common chemicals include acrylates and formaldehyde-based resins. Sunscreens and sunblocks, also commonly found in various moisturizers and cosmetics, can result in facial contact dermatitis, with or without activation by sunlight. Some of the “chemical-free” sunscreens, containing physical blocking agents such as zinc oxide and titanium dioxide, are better tolerated by people with sunscreen-induced contact dermatitis. Numerous topical medications can result in contact dermatitis when applied to the skin. These include lanolin, found in some moisturizers such as Eucerin, topical antibiotics such as neomycin (Neosporin) and bacitracin, para-aminobenzoic acid (PABA), found in some sunscreens, anti-itch creams containing local anesthetics, topical corticosteroids, such as hydrocortisone cream, and topical NSAIDs, such as Aspercreme. Reactions involving the tongue, gums, mucous membranes, lips and skin around the mouth can be related to various dental and oral products. The resulting contact dermatitis can be due to metals from dental work, flavorings from toothpaste, mouthwashes, chewing gums, foods from the Toxicodendron family (such as mangoes) and lipsticks or lip balms. The most common causes of contact dermatitis involving the mouth include flavorings (Balsam of Peru, cinnamic aldehyde) and other chemicals found in toothpaste and mouthwashes. Metals used in dentistry are known to cause contact dermatitis in the mouth and include mercury, chromium, nickel, gold, cobalt, beryllium, and palladium. While reactions to metal surgical implant devices are often suspected, reactions to the implants are rarely proven. Symptoms may include rashes (either over the site of the implant or generalized) and loosening of the implant and can occur as a result of the metal or acrylic glues used with the hardware. Patch testing with the metals found in the implant device prior to surgery may help identify people who are at risk of future reactions to surgical implant devices. Systemic (or whole-body) contact dermatitis, can occur as a result of medications, chemicals, and foods. These include Intravenous aminophylline (sometimes used to treat severe asthma), which contains ethylenediamine. People who use Benadryl products, and those with diabetes who use sulfa drugs or topical benzocaine may react to some oral diabetes medications (such as tolbutamide or chlorpropamide) also may experience contact dermatitis. The same may be true of a person who is sensitive to nickel if he drinks tap water with nickel, or eats foods prepared with nickel utensils. And some fragrance-sensitive people may react to citrus fruits or certain spices.